Professional ultra-high-speed machine for polishing. 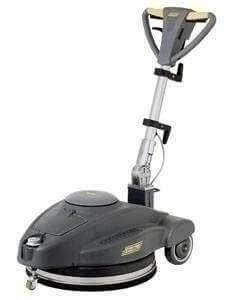 Ideal for contract cleaners, floors fitters, public clients. Very strong induction motor for long lifetime and great performance. Direct drive. Vacuuming the dust by a passive system thereby reducing duct impact while polishing. Brush pressure adjustment knob. Unique floating pad system (patent pending). Newest handle, ergonomy, safety and innovative, possible height regulation (patent pending) Low working height for cleaning under furniture. Latest generation model, designed for fatigue-free operation even during long working periods. The handle of the new Ghibli Ergoline single discs is articulated, robust and safe, with a very resistant and comfortable grip where all the controls can be put into action without moving the hands from the working position. The Single Discs 17” cover almost all the needs of the professional sector in terms of cleaning, treatment and restoration of all kind of hard floors (wooden floors, marble, stone and fine stoneware). Working width : 505mm / 20"